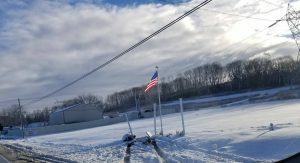 The winter storm which struck the eastern seaboard on Thursday and Friday November 15 & 16 brought a rash of calls for Eastern Berks Fire and all emergency responders in the area. 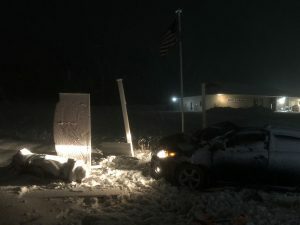 Before the storm even began, fire and EMS were sent at 0557 hours to Oysterdale Road in District for a car into a tree after trying to avoid a deer. 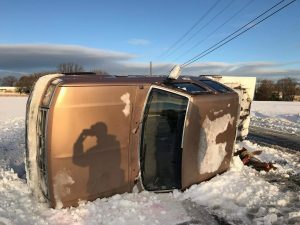 Then at 1756 hours, fire police from 97 and 95 were requested for traffic control around a disabled vehicle in the snow at a blind curve on Barto Rd in Washington. 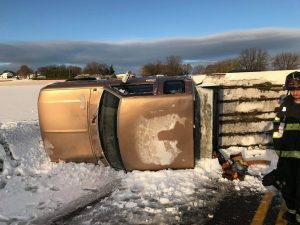 At 0712 hours, fire and EMS was dispatched for an overturned pickup truck on Hoffmansville Road in Washington. Fire Police from 97, 95, and 67 closed that road for a while. And this is only November!! UPDATE!!! 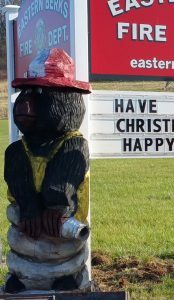 – after closer examination when the snow stopped flying, it seems that the wooden firefighter was “bearly” injured.